Incase you haven't already heard, I am running a promotion to kickstart the launch of my new online store and to get the word out about my photography! 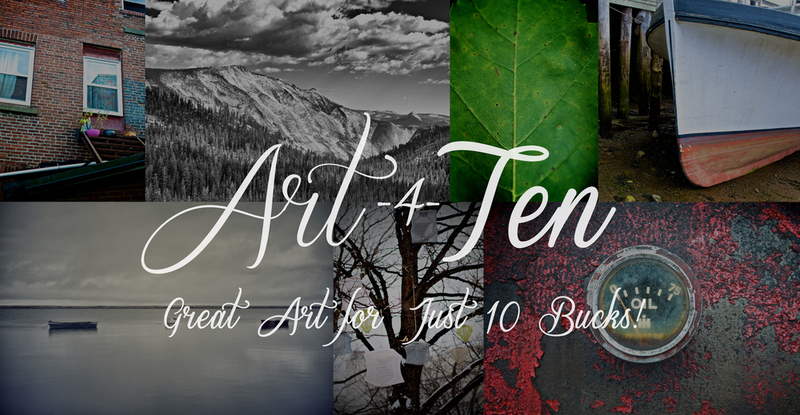 Art 4 Ten is an idea that I had been toying around with a few weeks back while trying to think of a way to make my art more readily available to people. The whole promo is based around digital downloads of full, high resolution photo files. This allows people to use it however they want; i.e. computer background, printing, etc. I feel that one of the things that keeps people from buying prints is cost. So dealing with digital downloads it eliminates costs like shipping, which for photos can be a pain. It also frees up the customer to pick the exact size they want, and gives them options to where and how they want to print it. I was a bit hesitant at first to go about things this way. Obviously selling your digital files opens up the possibility of the files being passed around, other people taking credit for them etc. However in today's world of the internet I think it would be even more of a mistake to not try and take advantage of making my work available easily to everyone, because with the internet my reach is pretty much unlimited. And so far I haven't been disappointed with how things are going. Only 3 days into the promo and sales are good, feedback has been very positive and the number of new people that have discovered my work is incredible. So I just want to say thank you to everyone that has participated, those that have already purchased photos, those who are going to, and to those who have been sharing this concept with their friends. You're all playing a part and I appreciate it like you wouldn't believe!